2 1)A: Why are you holding a piece of paper? B: I ……. (write) a letter to my friend back home in taxes. 2) A: Im about to fall asleep. I need to wake-up. b: I (get)……. You a cup of coffee. 3)We are so excited about our trip next month to France. We ……visit Paris, Nice and Grenoble. 4)I think he ….. ( be) the next British Prime Minister. 3 1- Bill starts work at 5 a.m. ………………… at four. ( he \ get up) 2_ I broke my arm last week. ………….. To hospital?. ( you\ go) 3_ We haven t got much time. We ………. Hurry. 4_ Diana ……… the exam. She s been studying very hard. ( pass) 5- I ve already finished all my work, so I …………….. Study tonight. I t think I ll read for a while. 6 – I ……………… forget to make my key with me. 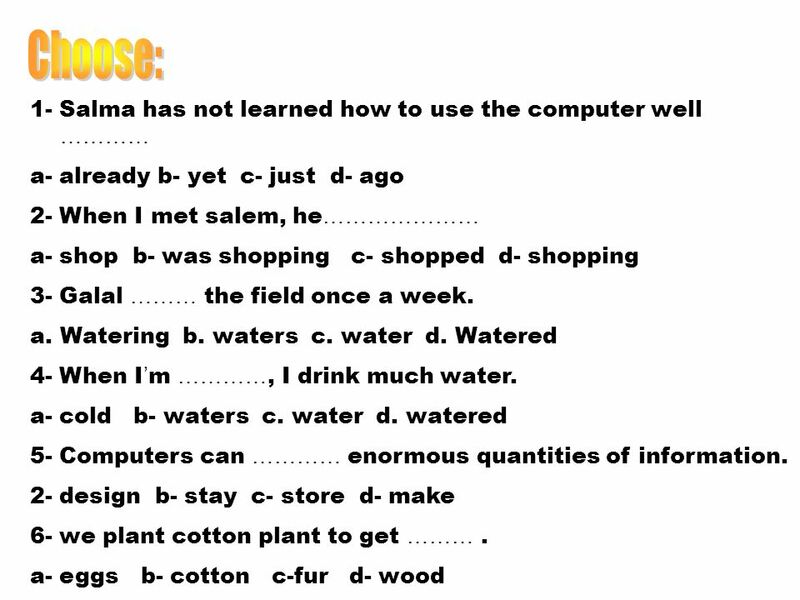 Download ppt "1- Salma has not learned how to use the computer well ………… a- already b- yet c- just d- ago 2- When I met salem, he ………………… a- shop b- was shopping c-"
There is NOT just one future tense in English.  Too many and too much are phrases that we use to say that there is more of something than is wanted.  I´ve got too many CDs. (I don’t have a place to. 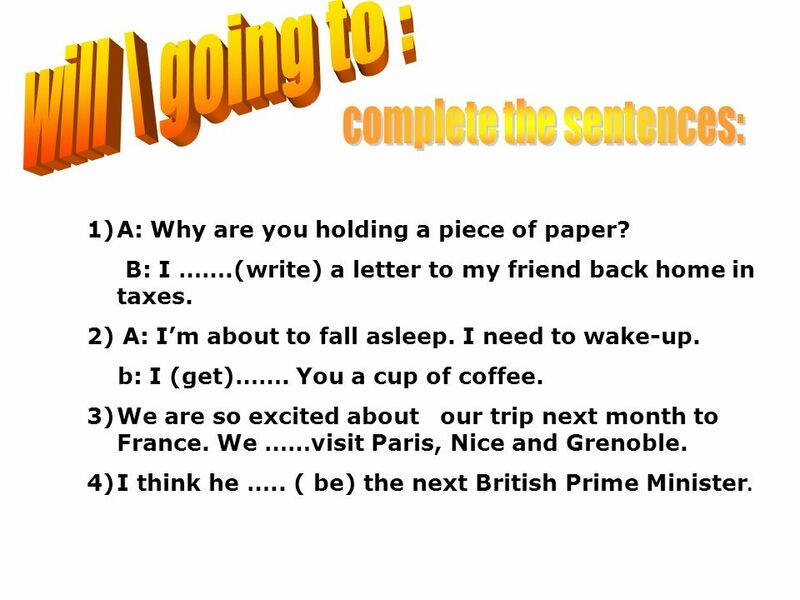 CONDITIONAL SENTENCES: FIRST CONDITIONAL. 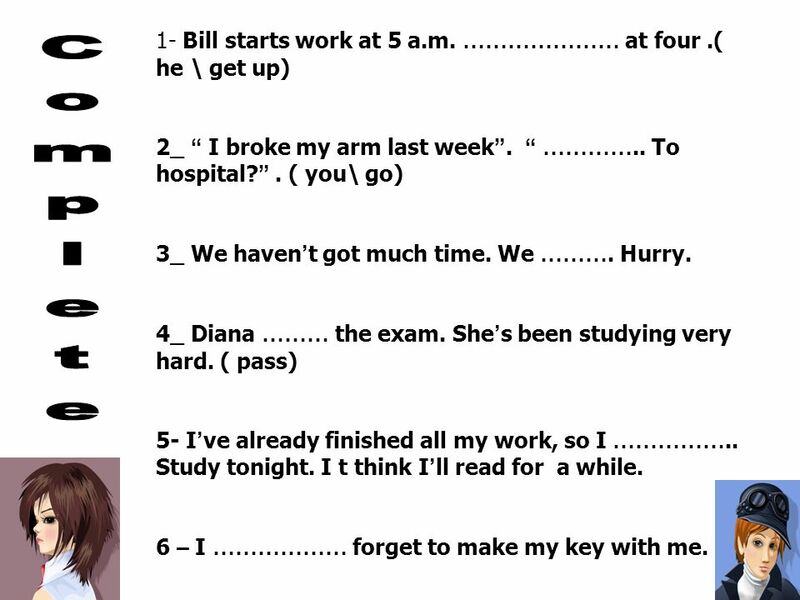 Conditional Sentences. Present Perfect Progressive By Elvira Zaripova, Nyagan. Quiz Passive Voice. Irregular Verbs The first round. 1a. BE GOING TO Per parlare di un’intenzione per il futuro I am going to study a lot next year I can’t come today. I’m going to see some friends. There.